Having just read Humphrey Lyttelton's final book "Last Chorus" where he talks about his interest in italic hand writing I was reminded of my own initiation into the world of good handwriting. In these modern times, where everything is punched out on a computer keyboard, handwriting has largely diminished to a shorthand for personal use which is undecipherable by anyone else. It was not always so. Until the 1990's handwriting was the main form of personal communication and was used extensively in business. Typewriting was expensive (it usually involved a professional typist) and time consuming (for the non professional struggling with a fearsome Imperial mechanical typewriter and Tipex correction paper). Lots of things were hand written from receipts in shops to personal letters. There was no email and letters had to be thought through before pen was put to paper. This brings me to the great shame of my own hand writing which at school was a serious cause for teacher concern as it was obvious I was not heading for a career in medicine. Part of the cause is my ambidexterous nature. I never settled on being right handed or left handed so my trachers decided I should be right handed. I also tend to have too firm a grip on the pen and my short thick fingers mean that I can't really grip a thin disposable ballpoint well enough to write properly with it. As a child I was introduced by my god mother to a book on improving your handwriting by Tom Gourdie. She evidently knew Mr Gourdie, a veritable God in the world of italic handwriting and calligraphy, as the book was personally inscribed. Incidentally this is the same Tom Gourdie who a breathless Humphrey Lyttelton ran down stairs to meet at a hotel in Perthshire as recounted in the book I have just finished. Sad to say that my general handwriting did not improve much beyond a tidied up 1970's school copy book style, but later in life I did master, to some extent, the art of italic handwriting using ink dip pens. At some point along this journey I realised that my handwriting improved with less friction on ther paper so I adopted fountain pens for every day use. 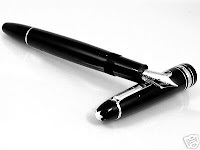 As a university student I set up my examination desk with three Parker Vector pens filled from a bottle, not cartridges, and would pile through my essay answers usually using the contents of two of the pens bny the time I had finished. In those days I prefered black ink. In business, where my hand writing is normally reserved for topping and tailing letters, I have moved to blue ink. The Parker Vector pen is too thin for my fingers, so these days I use a variety of pens of different (and often dubious) origins. There has always been something satisfying about writing with a fountain pen. It may just be the comforting memories of my grandfathers Swan pen kept in its original box with a bottle of permanent ink for signing important things, but writing by hand with a fountain pen does have a certain finality about it, even if Mr Parker now only seems to sell washable (and therefore eraseable) ink. Typing on a computer can lead to a disjointed style as you go backwards and forwards through the text correcting errors and changing ideas. The flow of expression is never the same as a hand written document. It may be faster and more legible but its never the same. When I write prose by hand it is more natural and easier to read. Its as if the human-ness of the writer is preserved in strokes of ink on paper. Maybe this is one reason why I often add important points in ink as a p.s. at the bottom of a letter. It serves as proof that it is not "untouched by human hands" and seems to put me more directly in touch with the recipient. While its still possible might I suggest that you dig out that old fountain pen from the back of your desk drawer and write a real letter or a real document, by hand? This article was typed on a computer.